Need advice about a specific Honda Pilot problem? Chart based on 162 repairs. See TSBs and recalls for the 2011 Honda Pilot. Chart based on 119 repair trips. The repair cost chart excludes repairs made under warranty, do-it-yourself repairs, and repair trips that include maintenance. See repairs for all Honda Pilot model years. US $45 This was for an oil change and to change out an exterior trim piece that fit over the hinges on the rear hatch door. They were poorly aligned when the car was purchased, replaced under warranty. 60000 mi Pilot has had VCM problems since the beginning and they have gotten progressively worse. Rough, clunky transition between cylinders and occasional vibration when cylinders drop. 21000 mi Constant issues with ECO mode and Variable Cylinder Management. Vibration and shuttering when in and out of ECO modes. Two updates dealership performed did not solve the issues. Reported to American Honda with no solutions. 25000 mi District Manager test drove to sense vibration issues in VCM mode and found nothing. So far vehicle still shutters and vibrates at 65MPH. US $679 Drained and changed oil to new Honda DW1 Auto Transmission Fluid and performed 30,000 mile tune up. 37000 mi Needed total brake replacement, including calipers. Needed struts. US $400 An intermittent popping sound from speakers, only when air is on. Doesn't matter if radio is on or off. US $1952 Alternator was making a noise, but still charging. Alternator was replaced. Power steering pump was making a whining sound. An intermittent popping sounds comes from speakers ONLY when air is on. It doesn't matter if the radio is on or off. 2nd time for same repair. Clock runs faster and faster when there is popping sound. 95600 mi Same issue as before, fouled three plugs. Was covered under warranty, three cylinders had piston rings replaced. 39000 mi Ongoing problem with creaky/noisy right rear suspension when going over bumps. Dealer lubricated suspension parts. Noise gone for now. US $200 Expansion valve was making a "squeaking" sound when compressor would cycle. Dealer diagnosed as possible moisture contamination in refrigerant. System evacuated and recharged. Noise seems to be gone. 35700 mi Steering has slight shudder/vibration when the steering is turned while moving slowly e.g. backing out of a parking spot while turning. Dealer replaced power steering pump and reservoir. Problem not fixed but not serious enough to return. US $35 3rd clutch sensor failed code p0348 ($35). Replaced sensor at home along with transmission flush. Caused stutter between 25-30 mph. These steps corrected the problem. Recommend changing fluid more frequently than suggested. US $8 Engine burns about 1qt of oil every 1,000 miles. Wife drives it, so worried that it will get low if I need to travel for extended periods. 81000 mi Engine was burning about 1qt of oil every 1,000 miles. 16000 mi rubbing or clicking noise that come from the rear of the car...maybe wheels but goes away as soon as the car warms or moves forward or backwards. When the car has been driven the noise is not detectable...need to leave car overnight. US $300 Drivers door locks stopped working...needed new motor. 21000 mi Replaced weather stripping at front of the sun roof as it started falling off. 22800 mi Passenger side automatic window got stuck on faulty part inside the door and would not roll up all the way. 7000 mi Drivers side sun visor would not stay up. US $120 Replaced original Honda rear shocks with KYB brand. Both shocks leaking. Noticeable difference in ride after replacement. US $100 Replace sway bar links. One ball / socket slightly loose. Replaced with MOOG greaseable. US $50 Sway bar link (one) failed again. Same side, driver side. 2000 mi Sunroof draining battery, and not functioning correctly. windshield washer pump not working well. replaced now working. The wipers that came on the car are horrible and would not be replaced under warrenty. US $100 Rear Shock replacement, the pilot would bounce all over the place on the road, especially when loaded. Oil leaking from one of the shocks. Replaced with aftermarket Excel G.
US $142 Battery died. I think it was weak from all the times it died with the sunroof issue from when it was new. 32000 mi Replaced front lower control arm rear bushings under recall - they had broken and leaked out all of their oil. US $800 Regular oil change, Front and Rear Brake Pads and Rotors replaced. Brake fluid flush. 39200 mi Driver's side running board was loose. Both running boards were replaced since the style was changed under warranty. 181000 mi P304 Error - Misfire on cylinder #4. 188000 mi Tires out of balance. Rebalanced tires and rotated them. 53900 mi It was covered by the recall. Engine misfire, engine light. VCM. Spark plugs malfunctioning. Spark plugs replaced and VCM reprogrammed. US $360 Oil pressure sensor failed and was replaced. Towed. 5000 mi The sunroof didn't operate properly. I reflashed the software using instructions I found online and the problem was resolved. 2000 mi A-pillar cover was rattling. Basically the plastic cover that attaches to the front right roof support post was vibrating and rattling. Dealer removed and installed insulation behind it. 2000 mi I put a folded piece of paper between the headliner and the windshield. The noise stopped. Back to the dealer, worked with the mechanic. He removed the sun visor and put some soft foam strips between the metal roof and the headliner. Seems fixed. 45000 mi Large chrome trim piece on tailgate rusting around both edges & above license plate. Rust forming where trim came in contact with painted tailgate, trim seemed to be "wearing through" paint. Rust 1st showed up after 1st winter. 50700 mi Tailgate/hatch was rusting YET AGAIN around chrome trim above license plate. Problem is same as Nov. 2012, chrome trim rubbing and wearing through paint and causing very obvious rust at both ends of trim, which then stained tailgate slighty. 3000 mi Weak spring in moon-roof air deflector. Replaced deflector unit, problem resolved. 8000 mi Sunroof not automatically closing. Recall. Recirculate/fresh air blend door stuck on recirculate Bad weld/frame creak in passenger side front door frame. 16000 mi Loud tinging rattle from passenger side airbag area. They tore the dash apart and sound deadened until they got it. 17000 mi Fresh air blend door was sticking as a result of a botched re-installation of the AC blower assembly after failed attempt at frame creak repair. They replaced the whole blower/filter/blend door assembly. 35700 mi Front passenger side strut started thunking. Strut was repaired easily enough but we're on our third attempt to get the alignment right and the steering wheel centered. 66000 mi Suspension bushings worn out. 78000 mi Fluid filled compliance bushings replaced, both front. US $50 All three spark plugs in rear bank oil fouled. Replaced all 6 plugs. US $60 Both rear view mirror motors replaced due to sticking and inconsistent positioning. US $1343 Battery acid leaked and ate through the battery cable. Had to get a new battery installed and new cable. Rear right shock absorber was leaking and has to be replaced. Power steering fluid had to be replaced. 22000 mi Makes a creaking noise over bumps at slow speeds. Can only hear it when windows are down. Dealer says they could not hear noise. Update: new 2013 makes same noise, might be "normal." 38000 mi Replaced LF wheel-bearing under warranty. 20000 mi Battery tested poorly in inspection, replaced. US $50 Transmission pressure sensor failure. 920 mi Memory Seats did not activate or work. Electrical problem from factory, power cord plug prongs were bent from factory, made new plug. Memory seats work after repair. 1240 mi Back Tail Gate strut was replaced, Door sqeeked when opening or closing. 4820 mi Replaced key fob. 6820 mi Glove Box rattle. Honda said there may have been a TSB. Repaired at dealership. 19000 mi Noise in steering when moving vehicle after parked. Dealer said they could not dupliacte noise. Noted in file and will return when noise becomes more consistant. 8000 mi Clicking noise when stopping car coming from brake pedal. Noise from dash back again! "spot welds?" Took Honda rep for ride and noticed they all do "it" Not happy with Pilot. 23000 mi Steering wheel making clicking sound when turning. Dlr replaced steering cable for second time! 23700 mi Paint bubbling around chrome trim above licence plate.Dealer repainted hatch,replaced chrome molding. Still need to have creaking dash repaired. Also replaced for second time, steering cable! This truck is a POS. Never buy another Honda! 27000 mi Problem with clicking from steering wheel is back for third time. Also complained to service manager about creaking noises coming from pass side dash when braking or taking off from stop. Waiting for area service manager from corp. Honda! Aug 2010 Hood release didn't work when we took delivery. Didn't know it until two days after we picked up the car. They had to cut a hole in the grill to open the hood to fix the release cable and replace the grill. 2300 mi The motor that drives the forward and backward movement of the front passenget seat is becoming non functional. It moves the seat very slowly, and makes a really loud whining sound. Definitely on its way out. Parts ordered. C $25 Fix flat tire. Grrrr. Vehicle delivered with a slow leak in tire. Dealership says unrepairable & not their problem. Michelin warranty covered with $25 deductible. Imagine, I pay extra to swap OEM tires with Michelins. Doh! 46900 mi This was a 2nd attempt at a repair that was originally a recall notice. Initial repair was preventive. But then within 3 - 6 months I could see rust marks originating from under the center trim piece of the tailgate. US $115 Plugs fouled due to VCM. This first round they said was only software - they did replace plugs 1-4, i paid to have the remaining two plugs replaced at my expense. It sounds like if this happens again, they dismantle the engine and put different piston rings on etc. There's an extended Honda warranty for this issue for 8 years and unlimited mileage if I'm not mistaken. US $900 Passenger side radiator fan (condensor fan) needed to be replaced after bearings went. Noticed noise first, and wobbling after inspecting. Fan replacement was close to $600. Replaced both rear struts on this trip as well. 101000 mi Back in for tailgate rust for the 3rd time, hopefully the last. They doubled up the gasket this time... time will tell. US $91 CEL, Check emissions system, Check VSA, Check VTM-4 lights all on -> misfire in cyl 2, covered by TSB 13-082 extended warranty: dealer replaced spark plugs in cyls 1-4 and updated software. Not covered plugs in cyls 5-6, so paid for these plugs to be installed (near 100k mile service when plugs should be replaced anyway). 95500 mi Dealer performed oil change, oil dipstick seized in spool valve and handle broke off, cannot remove dipstick, requires $560 repair to replace spool valve. We tried to get the dealership to accept partial responsibility (it wasn’t broken before the oil change), but the service manager got defensive and his boss never called us back. They lost all our future business (maintenance and car purchases). 82300 mi Dealer replaced lower A arm bushings at no cost to me. Suspension component part of a recall. C $66 AC not blowing cold at all - recharged system with leakstop and refrigerant. US $100 Headlights had become so cloudy that light was not very noticeable at night on a dark road. This documents the need to restore the finish. May 2011 Rattle when driving on roads that have potholes or are not smooth. Thought it was the roof, noticed same sound if I tapped on it. Dealership said it could have been a loose child car seat, they tightened that & the center console clip too. US $95 replaced a spark plug on the 6th one. US $1400 Replaced timing belt and water pump. 23560 mi Backup camera has no image 50% of time. Dealer says problem can't be reproduced in their shop, so can't fix. Even though dealer was shown photos of a black camera screen. And sales person has seen camera not work. US $25 Replaced Driver side mirror glass. It kept falling off. Also replaced the trim on the rear windshield wiper. Replaced headlight bulbs. 29340 mi Body panel behind driver's door misaligned, stuck out far enough to have paint damage from dust, sand, etc. The fix required body panel alignment, touch-up paint, and a strip of plastic stone guard to protect the panel. 9000 mi Rough starting. Dealer unable to duplicate Shudder in ECO mode. 136000 mi Blowing warm air on driver's side, cool air on passenger side, even cooler for rear passengers. Evac and charge took care of problem. US $30 A/C blowing cool (not cold) on passenger side, warm on driver's side. Trip to local auto parts store to re-charge A/C took care of the problem. 19700 mi Chipping paint near driver door kick panel. Will be repainted by dealer at end of July. 62300 mi front control arm bushings leaking. 13500 mi Repaired the roof gasket. Repaired the roof gasket. 19000 mi The driver side window was malfunctioning. 34000 mi clicking noise caused by faulty blend door actuator located under the center console - this actuator sends air to either the registers or floor vents for the rear seat passengers. replaced faulty motor assembly. the key fob/door lock remotes were poorly sealed due to a design flaw. this exposed the inner electronic circuitry to moisture, causing corrosion and device failure. The dealer replaced the seals and the inner circuitry on both keys. US $475 The air mix/mode actuator located in the center console between the two front seats stopped functioning correctly and made a loud intermittent noise. This actuator diverted air flow between floor and console registers to the back seats. 4000 mi Trim left side by rear hatch separated. Parts ordered. Panic alarm sometimes goes off when key turned in ignition. 4800 mi Issue with panic alarm going off still not resolved. Rear molding replaced and now fits correctly. 10000 mi Panic alarm goes off when inserting key in ignition. Parts replaced and it appears that the problem is solved. Loose trim in left rear pillar also repaired. 50000 mi Airbag recall for Honda and leaky ball joint. Airbags were OK, so no repair. Leaky ball joint replaced under warranty. 19500 mi Hub bearings had a noisy roaring sound from the front wheel area. The car now very quite since they were replaced. US $70 Driver Side Sun Visor sagging down would not stay up. Had to replace. Bought part online. Replaced myself. 23000 mi Dealer replaced both power seat tracks. 400 mi Re-applied the 3m protective film on driver side rear wheel. It was put on improperly from manufacturer. Re-applied the 3m protective film on driver side rear wheel. It was put on improperly from manufacturer. 3800 mi The navigation system turned into night mode (dark, unreadable during day) during the middle of a sunny day. It would not go away. Software glitch. Wind noise from driver window, and a rattling noise from rear driver side door area. They cannot check the wind noise because it happens over 60 MPH, and they cannot hear the rattle. Brakes were squeaking, apparently they had residue on them and had to be cleaned. Don't squeak any more. The navigation system turned into night mode (dark, unreadable during day) during the middle of a sunny day. It would not go away. Wind noise from driver window, and a rattling noise from rear driver side door area. 50000 mi Lots and lots of rattles...really disappointing for a Honda. There are so many that I really cannot tell where all of them are coming from. 58000 mi The engine cylinder management system was malfunctioning causing the vehicle to jerk strongly when accelerating moderately. 12000 mi Key fob was replaced due to not working correctly at locking and unlocking the doors. 14000 mi Vehicle taken in for transmission shudder when shifting into second gear. 16000 mi Key fob module bad, replaced at no cost under warranty. 36700 mi Bubbles formed on vinyl console lid. Dealer replaced lid under warranty at no charge. Key fob working internittently. Dealer replaced key fob module at no cost under warranty. US $328 Flashing shift (D) indicator. Replaced 3rd gear pressure switch. Was also advised that lower control arm bushings are leaking and need replaced. Quoted $815 plus alignment, did not replace at this trip. 67000 mi Lower control arm bushings leaking as discovered during previous routine maintenance visit. Honda eventually extended warranty on this common problem. Replaced an aligned at no cost to me. US $9 Symptom: Loud intermittent engine noise. Engine examination and internet search finally led to faulty relay. Replacement AC compressor clutch relay purchased from dealer and replaced. 15000 mi Difficulty with the Key Fob to Lock or Unload vehicle doors. Had to press button multiple times to get reaction. Dealer said some owners were reporting the problem, and they replace Key Fob internals. 61400 mi Customer hears something rattling around in steering wheel when making turns. Removed air bag and found plastic tab from bracket broken and tumbling around. Removed loose piece and reinstalled air bag. Air bag removal done during recall. 73000 mi Noise in left front, esp. when road is rough. Replace both front lower control arm compliance bushings and perform alignment. 52700 mi Check Engine, VSA, and VTM-4 warning lights on. Did not notice any issues other than the warning lights. Dealer checked for error code and found it was a misfire on one of the cylinders. Dealer replaced spark Plugs. Work done on warranty. 66520 mi Noisy heater fan. Had to be replaced. 85560 mi Corrosion on Tailgate. Known problem for which there is a model year extension. 96100 mi Vehicle had a vibration/shudder and a ticking/clicking sound just before the ECO function triggered. Dealer claimed that was normal (this was not normal)and there was nothing that could be done. After the visit the problem is gone. 102300 mi Check Engine , VSA, VTM-4 warnings lights. Dealer pulled code PO303-misfire on cylinder. Dealer replace piston rings on cylinders 1, 2, 3. US $160 Door lock actuator on driver's side was making a rubbing noise. Needed replacement. 4000 mi Moonroof auto-close did not always work automatically. Interior trim piece would pop out of place at random. Piece was located at driver's side of dashboard, inside door jamb. Dealer ordered part when the vehicle was in for the moonroof TSB and replaced it at a second visit. 9000 mi Third row release handle "popped" and would not spring back to position. Still functional, but not normal. Hood not properly aligned with front fenders at factory. Hood flutters at highway speeds. Shop realigned to my satisfaction. 28700 mi Car has always pulled to the right. Finally found TSB 10-029 which says to replace the front springs. Dealer followed TSB 10-029 and was covered under good will warranty. 81000 mi Transmission oil pressure switch needed to be replaced. Relay for a/c compressor for stuck on and it over pressurized the system causing the release valve to release freon. Relay was replaced and system recharged. 83000 mi The compliance bushings cracked. The dealer replaced control arms for free according to Honda's voluntary 100000 miles warranty extension. 20300 mi Dealer replaced whole back window. To ensure problem does not repeat. 40000 mi premature replacement of battery. No fault found, but a couple of years too early.. US $500 Driver's lumbar support came off its track and motor quit working. $250 parts, $250 labor. 106000 mi AC compressor relay stuck, compressor over pressurized system and cause bleed off valve to break open to vent. New relay, new vent valve, recharged AC. Had to replace radiator fan relay a few days after as well. US $450 Rear shocks completely worn out and leaking. First replacement of factory shocks. 80000 mi Repaired or replaced failed transmission sensor. 96000 mi Replaced intermittent radio under extended warranty. US $250 driver visor broke. It was stuck in the down position. A whole new visor had to be ordered and installed. US $1800 Milled the rotors (vibration when braking) and replace pads front & rear. US $630 Vehicle went in for scheduled spark plug replacement and valve adjustment. US $150 Replaced original battery. 52000 mi Wheel vibration at highway speed. US $500 We had the front end rebuilt for the 2nd time. Shocks wore out in less than 18000 miles and control arms were replaced. Now we have a warranty on the repair per a letter from AHM stating that it is a known issue in some vehicles. US $85 Replaced front pads, Honda paid to resurface rotors. I paid 85 dollars for the pads. Also, Honda replaced both rear shocks under warrenty. Shocks were leaking. Rotor resurface covered under warrenty. C $900 Main shaft bearing needed replacement. Had to change the whole shaft. 14000 mi Heard noise that sounded like a dry bearing coming from front of car. Dealer discovered RF wheel bearing bad. Had parts on hand and repaired at no cost. 35000 mi Replaced torn cv boot. 49300 mi Front right shock absorber failed. Replaced. US $58 Both front lower control arm bushings cracked. Left bushing leaking. Replaced under extended warranty. US $540 Compliance bushings failure. US $150 Left stab bar. US $600 knocking noise out of front suspension. Replaced all struts in vehicle. 40300 mi Small leak in one back shock. Dealer replace rear pair Navi screen listed problem as 'disc read error please consult dealer.' Dealer could not replicate error since it reset with ignition so just cleaned disc. Error came back. 59520 mi Transmission shudder when shifting into drive, intermittent issue. US $150 interior map lights and backseat overhead lights were burning out in less than a month's time. Had the map light's motor? replaced and has worked fine since. US $200 Brake trouble light kept coming on. VSA modulator replaced. 84000 mi Bearing shot in heater biower motor. Replace all spark plugs because of concern with cylinder design issues. 22000 mi power seats when moved forward and back would be bumpy when sliding on track. Seat would not hold secure in position. Dealer informed TSB issued but parts not in stock. Ordered parts awaiting dealer call back for service appt to replace. 22000 mi repaired seat track issue. Dealer called and installed in seat tracks for both driver and passenger. Seats now move freely and smoothly. US $605 driver sun visor keeps failing and not holding in uprright position...was told repair is out of warranty and Honda does not cover cosmetic repairs on extended warranty which was purchased when I was sold the vehicle and not told of this. US $250 Front lower control arm bushings were torn and leaking fluid--Carmax had to replace the lower control arms (under extended warranty) Washer fluid pump screens were clogged and causing fluid not to flow into the pumps--didn't work. US $240 An internal pressure sensor went bad. It had to be replaced. US $900 lower suspension arm bushing failed as they all do they should be recalled! 37000 mi knocking sound in engine. part was replaced. 37300 mi Some interior trim at door jamb behind driver. Dealer repair satisfactory. US $80 Replaced lift struts on tail gate. US $1200 A/C not working. Had to replace compressor, clutch and coil. US $1923 Passenger side trim repaired on rocker panel. Looked to me like fasteners failed. Inside part closest to rear tire cracked and caused other fasteners to fail. 49000 mi Noise with window. US $1750 Slight noise heard. Dealer took apart engine found scarring on cylinders, replaced entire engine. 500 mi Loose bolt inside passenger door causing rattle. 1000 mi Rattle coming from driver side window. Dealer stated problem was caused by a spot weld in B-Pillar. Problem recurring. Window "scrunch" noise as outlined in Honda Service Notice for 2008 model year Pilots. US $1500 Went to dealer for passenger side front shock problem.Vibration and rougher ride from passenger front side.Fix:Replace broken leaking companion bushings and right front shock.Rough ride persisted,blown shocks all around replaced by friend. US $1075 Engine and VSA light on. Ran fine but took it in. Read about TSB's regarding regarding random misfire. Diagnosis was PO302 misfire #2 cylinder. Fix: Replaced all sparkplugs. Also had fuel injection and throttle cleaning done plus alignment. Engine and VSA light on. Ran fine but took it in. Read about TSB's regarding regarding random misfire. Diagnosis was PO302 misfire #2 cylinder. Fix: Replaced all sparkplugs. Also had fuel injection and throttle cleaning done plus alignment. US $800 Had to replace the rear shocks and the compliance bushings went out at 37k. Verified by the dealer but probably went out in warranty. Planning on pursuing reimbursement complaints to Honda. Tires also only last under 36,000 miles. 30000 mi Had the paint chips from TSB 09-55 repaired. It took 2.5 days and was covered by warranty. The repair was completed however still see a small line where paint will likely chip again. I'm not going to bring it back, just hoping that it will last. US $190 Key fob reprogramed....now it works new. US $400 replace passenger side front wheel bearing. US $600 Radiator transmission cooler failed allowing transmission fluid into cooling system. Lucky, no coolant into transmission or transmission would need replacement at about $3400. Dealer estimate for radiator and flush only was $1800. US $631 Replace fogged headlight assemblies. Renewed 2 leaking windshield washer pumps--front and rear. Excessive engine oil consumption. Oil level dropping below "add" before change due. Added "5 minute flush" to oil and idled (only) for 5 minutes per instructions. Changed oil and filter. Apparently an increasing problem for Honda even with specified oil change intervals. 500 mi Intermittent interruptions while talking through the Blue Tooth connection. I am hearing everything but the other end of the call keeps getting gaps in the conversation. The calls work perfectly while using my Jawbone handset. This is still not resolved. 56000 mi When I drive at speeds in excess of 55 MPH I get a high pitch rattle in the driver's window. I also had to replace the rails the driver and passenger seat move along as there was significant bumps felt as the seats moved forward and backwar. 112000 mi AC blower motor and AC recirculation vents not working. 9500 mi Car was burning 1 qt of oil every 2,500 mi. Honda tech line said not problem. Honda regional service rep overruled, did a leakdown test and found fouled plug..all seals rebuilt, and short block replaced. Honda will analyze my old block for problem. Engine using 1 qt oil every 2,500 miles. Dealer did testing including leak down test. Valves sent out to mach shop for redo and engine short block replaced (ie essentially new engine). 15 days at dealer. Under warranty. Told cost approx "$10,000". 32000 mi Driver's side visor was replaced under warranty for dropping. 57761 mi Replaced the lower control arm bushings due to leakage. Front wheel alignment also done. All done without charge because Honda issued a warranty extension campaign. 84687 mi When I start the car, there's a rattling sound that lasts for about 20 seconds coming out from the center console . If I turn off the engine, then turn the key to the slot "II" just before starting the engine, I get the same rattling sound for about 20 seconds. Very consistent result. Doesn't matter whether the engine is hot or not, I hear the rattling sound for about 20 seconds, then it stops. The rattling comes from the rear part of the center console which is the rear A/C unit area. You can feel the rattling. Mechanic said he would have to remove the center console to find the source of the rattling noise. I didn't have it done. Rattling stopped in Nov 2017. The same scenario happened in Sept 2015 at almost 60,000 miles. Took it to dealer who said it might be the air mix motor. No work done. The rattling went away in Oct 2015 . 7000 mi Reverse sensors suddenly stopped working. 33000 mi Lumbar in drivers seat doesn't work properly. It moves and rattles while driving. 19000 mi Pipt has been back to the dealer several times for a shuddering problem when going into ECO mode. I was told several times that "they all do that" but I persisted and finally they changed the "A" pipe of the exhaust system. That probably fixed it. 29000 mi This time they cleaned the EGR. Didn't fix the problem. US $40 Lower control arm bushings replaced on both sides. OEM had fluid for dampening - fluid leaked out, causing brake wobble and vebration on highway. New OEM parts have changed design. Not covered by warranty due to mileage. Tailgate electic button replaced. Door unlatched every time the car was started. TSB from Honda on this in 2009 but mine didn't start acting up until this fall. Requested goodwill consideration, Honda paid 75 percent (my share $40). US $1544 Brakes pulsated when applying brakes. Had rotors replaced and new pads installed. 1000 mi Took the car for a shudder at light throttle. Dealer said there was no problem. Car also has tires that are unbalanced, start vibrating at 75mph, dealer did not re-balance tires because they could not feel a vibration. US $50 Replaced front windshield washer pump. US $50 Rear glass washer pump was leaking. Replaced with new. US $550 Engine whine that matched RPMs and battery light came on. No noticeable electrical power loss but battery metered out lower with car running than static. Alternator. 38000 mi Rear passenger power port would pop up while pulling out an adapter. A new power port was installed. On the left most third row seat, the handle on the back of the seat it coming off and a new handle is on back order, I was told this is a common problem, hence the back ordered part. US $300 One of the six ignition wires failed, cause lack of power, RPM flucuations. It did not show in a code right away but finally it did after a month of symptoms occurring randomly. One ignition wire and six sparks plugs were replaced. Original battery failed. 1000 mi 2 Repairs for the 09 Pilot. Rear speaker system did not work - bad wiring connection from car manufacturer. Also had trim on passenger side door replaced - door ding from delivery of vehicle to dealer, also had stripe trim replaced. 3000 mi Alarm installer sliced leather steering wheel with tool so this trip was a fix of that. Power seat on drivers side made a thumping feeling -I thought it just needed grease but it needed a new seat track Seat track was replaced and problem solved. 28500 mi rear latch "switch" is failing. interior lights come on while driving and hatch tries to open and close. safety mechanism won't allow it to open but you can hear it trying. 35000 mi Seat coming apart by the seatbelt area again - told it's due to getting in and out of the car. 2nd repair, they won't do it again once the warranty is over at 36k. 32000 mi Water entered switch in rear of car (near hatch) and caused int. lights to come on, or door ajar lights to come on. Probably occured at car wash. dealer cleaned out and is now fine. 65000 mi Pilot needed a new power window motor and switch. 68000 mi Motor for passenger window burned out due to water getting into it. They re-routed the wiring harness and so far it's okay. US $250 windshield washer reservoir was leaking. I had the reservoir replaced and that didn't fix it. Had to get new seals where the pumps attach to the reservoir. That didn't do it either. we ended up having the shop use the sealant spray to coat the area and finally fix it. If I did it all over, I would have replaced the pumps too. Jan '18. STILL not fixed. The solution is new pumps and seals for the reservoir. I tried to re-use the original, working pumps. US $75 Check engine light was on, code revealed that there was a brief error code with an emission sensor. Code was cleared, however because nothing was currently malfunctioning I was responsible for repair. US $27 Windshield washer leak at tank. Replaced front windshield washer pump. 9000 mi Misaligned bumper led to the headlights rubbing the bumper and chipping the paint. Never repaired. 5000 mi Right side dash rattle,successful I think they taped mounting tabs on passenger side under dash airbag. 43700 mi CEL, throttle cleaned. US $200 The lock of the glove compartment fell off. The dealer refused to install the existing lock (which I had), so they needed to order a new lock for a price that I couldn't justify. Did not fix. US $100 Bolts holding the exhaust pipe broke, needed to replace them + some $20 metal part. US $700 Power steering pump, serpentine belt, tensioner got replaced. Power steering fluid got replaced. There was a leak in the power steering pipe. US $120 Oil sensor was malfunctioning, presumably because broken or the pipes requiring cleaning. Check engine light and VTM dashboard indicator have been lit. Diagnostics revealed P3400 error code, if I'm not mistaken. Required cleaning of some debris from the oil pipes in the engine as well as engine diagnostics job. 13000 mi Dirty NAV screen shield. Installed new one. 3000 mi Third seat back release lever had to be replaced. Tailgate switch on door of Touring model did not operate. Dealer ordered part, but this did not fix the problem. Dealer then order another part and will have to bring the Pilot back to be fixed. Failing to fix the problem of the tailgate switch not working by replacing the switch, the Dealer ordered a control module. When install the switch did work and the problem was fixed. US $150 Bolts attaching window in rear hatch were defective and had to be replaced. Window was loose and was allowing dust and water to leak into interior. 25000 mi door locks kept cycling, it was determined that the rear liftgate lock was not locking. they replaced the lock mechinism. 22000 mi Center console cover ordered because power outlet fell out repeatedly. 64500 mi Replaced a headlight. Replaced the other headlight two weeks later. US $28 Paint peeling from handle on driver's door. Dealer didn't know what to do. Said the person who deals with paint issues comes to the dealership only once a month. Dealer could provide a schedule for the next visit. 90000 mi Had a progressively louder noise at idle to 2000rpm and performance was down. Replaced the front bank camshaft via Honda Care warranty. 1000 mi Driver door stop replaced which was loose causing a snapping sound when opening or closing door. 2000 mi A piece of door trim kept falling off and I was going to wait to have it replaced until an oil change but I didn’t notice it fall out and lost it. Honda replaced the part for no charge since it was the same door that had the door stop replaced. US $450 Driver window switch stopped working, replaced switch assembly. US $13 The rear wiper was not correctly mounted or aligned and would dislodge during trips to the auto car wash and break. Wiper motor seemed to be misaligned internally and or the blade itself. After trip, issue fixed was to push the wiper motor assembly over. 3720 mi Moisture buildup in headliner due to no seal at top of windshield. Headliner removed, dried, sealed and reinstalled. C $250 Track for drivers seat had to be "ironed" out to make forward and back motion smooth. Second attempt; will replace if problem occurs again Vehicle would randomly not start as if the battery was low. Battery cable was found to be loose and couldn't be tightened so assembly was replaced Drivers side visor would not return to closed position (there was a gap between the visor and the headliner) Replacement visor was installed. 19220 mi Third problem with vibrations of drivers seat. Seat guide replaced. 15000 mi TSB-055, the fender and bumpers rubbed together under the headlights, causing tiny paint chips. It's minor now but many years later would cause potential rust in this area. 36000 mi The paint on the read window shades was gone, exposing the copper metal underneath. Since it was almost the end of the warranty, I had both replaced. 77000 mi Left front parking sensor had an intermittent fault. Lower control arm bushings blown. Caused shaking on the highway. 78300 mi Loose Tie rod end and leaking Steering Rack. The whole rack was replaced. Steering is noticeably smoother now. 96200 mi Started getting read errors in the Nav system. A new disk didn't replace it but it was temperature sensitive. HondaCare warranty replaced the entire system. 111000 mi Mirror motors jumping, both replaced under warranty Compressor Relay intermittently failed. Replaced relay. Water pump found to be leaking during timing belt change. Pump replaced. Timing belt tensioner found to be failing, part replaced. 113000 mi Compressor was making noise, replaced. Tensioner for serpentine belt making noise. Parking sensor flaking out. 92800 mi Propeller shaft replaced because I was having a persistent vibration at highway speeds. US $675 Leak in the High Pressure line. I think this was due to the line not being clipped in when the compressor was replaced, causing it to rub and leak. US $1438 Developed a loud ticking audible above 2500 rpms. Intake lob for cylinder #5 found to be worn down. Camshaft and Rocker etc replaced. 2000 mi Some plastic interior trim pieces replaced because they were blemished. 27060 mi Emission light on, VTM-4 light on. Dealer BS'ed me that fuel injectors are gone and repair estimate is 1000. I went to local mechanic and he fixed a pipe for free. $120 Throttle body was not working properly. It was cleaned, re-programmed,by Honda Dealer. $110 excessive oil consumption. add oil every 2,000 km. US $250 Replaced warped front rotors and scored rear rotors from stuck rear brake. Replaced all Brake pads and brake hardware. Relubed caliper brake return pins. US $192 sway bar links on driver side worn. Had replaced. lower control arm and bushing bad. Both replaced under manufacturers extended warranty. US $240 Replaced worn brake pads, rotors for all four wheels, replaced brake fluid. US $400 Replaced timing belt, water pump, tensioner s drive belt and fluids. 101000 mi Drive side strut replaced for the second time for free. C $979 Replace: Rear Sway bar bushings Rear Sway bar end links Replace: P/S Front strut assembly. P/S and D/S Front Lower control arm bushings. US $15 AC has been more and more intermittent so I tried recharging it myself but the problem persists. US $20 Air conditioner was working sporadically as the compressor wasn't kicking on. Recharge didn't work. Replace the compressor relay and all is good now. 75000 mi Spark plugs fouled due to the VCM system shutting down three cylinders in ECO mode. Eventually this causes fouling of the spark plugs and the CEL illuminates for misfires. 100000 mi Piston rings replaced. Honda VCM system causes sludge buildup in cylinders leading to engine failure. US $350 Broken sway bar on one side, cracked on the other. US $450 Tighten Fuel Cap warning kept coming on. Replaced (myself) the fuel cap and it didn't work. Dealer diagnosed the Purge Valve solenoid was failing. Expensive part replaced by the dealer. US $500 Replace front right strut. 6000 mi Wheel balance issue from delivery. Two trips to dealer so far and still not right. US $200 The hose broke and I got new plastic sprayers for the hood. Again cheapo parts by honda. US $500 Honda made it with a cheapo part and the dealer said a good one would be good to replace. US $189 Left front wheel was making a “grinding” sound and required a new wheel bearing. 2000 mi The clips holding the map light were not assembled correctly, allowing the map light assembly to hang below ceiling with quarter-inch gap. 27000 mi Motor for passenger side mirror was binding when adjusting the mirror from bottom to top. US $624 Lower control arm bushings were torn; Both sides replaced; Price includes required alignment ($89.95). US $750 Extracted oil dipstick (handle was missing; broke at some point). Check engine light was coming on intermittently. Cleaned the fuel injectors. Lights came back after a day or two. Cleaned and adjusted all intake valves. After a few days, the lights returned. Throughout January, lights would come on every week or so. 72700 mi Check engine light due to two cylinders not working correctly. This is an ongoing intake valve issue which started in December 2014. Lights came on again the following week. 74300 mi Check engine lights keep coming on due to issue with the intake valves. They were cleaned one more time and appear to be working correctly now. Although, the engine does not sound as smooth as it did before. US $700 Battery (5 years old) and original alternator replaced. 2200 mi Repair lumbar support in drivers seat, fix trim piece on passenger side I pillar. US $27 Oil Change, replace drivers side mirror glass due to scratch, replace clip on third row seating rear cover, replace trim piece on passenger side "I" pillar, buff scratch on rear tailgate. All issues were from factory. US $50 Oil change shop noted that car was down close to two quarts of oil and it should be monitored. This is being noted by other Honda Pilot owners online. Car is burning oil and some class action suit about such is noted online. Please read up!! US $30 Rear wiper arm became misaligned. Removed and reinstalled motor. Replaced entire wiper arm. US $300 Swaybar bushing was worn and was replaced. US $170 Exhaust flange needed replacement. 65800 mi The front blower motor made noise on cold starts. Dealer replaced for free under dealer warranty. Keyfob range was too short. 90300 mi I had rust starting to form on the trunk door by the license plate light and by the lift handle. Dealership sent pics to Honda and they took care of it. Rear lower arm bushing was leaking (Honda just issued extended warranty coverage for it). At the same time we replaced a tierod that was loose (since the alignment was free) Loose tie rod end, so we replaced it during the visit because the shop was taking care of other stuff already. C $374 scraped from rear ended up being rotors and pads that needed replaacement. $30 Loose side boards retightened. The bolts were worn out - replaced. $1000 Rear CAT blockage led to poor acceleration. Fuel pump, spark plugs aand CAT replaced. 29000 mi Exhaust leaked into car. Changed gaskets on rear tailgate door and window. 93200 mi The AC unit was shutting off the starter and the car would not start. This happened twice. First time care was jump started. Second time car was towed to dealer. 300 mi New vehicle problem Air conditioning to rear blows very hot air. Replaced door mechanism in ducting.. Warranty work. 9000 mi Shuddering under modest braking suggesting warped rotors, All front and rear rotors resurfaced Warrantied. 31000 mi Rubber strip on sunroof had fallen off. Had dealer repair under warranty. 39800 mi Code U0122, problem with ECU. Many warning lights on: VSA, flashing D in transmission, etc. Car locked transmission shifter at one point and had to be overrode in downtown Toronto! Repeated 2x after dealer initially cleared but now ok. US $725 VSA, ABS and VTM-4 warning lights on. Independent mechanic diagnosed failed rear wheel sensor and corroded harness. Replaced parts, but VSA light remained on. VSA, ABS lights on. Dealer diagnosed failed computers controlling these systems. Dealer said vehicle unsafe to drive. Honda covered part of the cost of repairs. 47300 mi VSA, VTM-4 warning lights returned along with flashing D from transmission. Dealer diagnosed failure of wring harness requiring dash removal, a time consuming repair. Honda good willed approx. $1200 worth of this repair. All previous warning lights returned about 2 weeks after previous repair. Dealer replaced both Power Control Module and Electronics Control Module. No problems have re-occurred now after about 5 weeks (keeping fingers crossed!). 51600 mi All previous warning lights returned, but would go off on restart, so took to dealer who said "no codes stored", but independent pulled codes when oil changed recently. Lights currently off. US $100 The VSA/ABS Flashing D set of warning lights came on with increasing frequency as the weather got colder. Would not return on restart once vehicle was warm. Left wiring harness replaced. Update: finally seems to have fixed the problem. 69000 mi Check Engine Light on. Codes show multiple misfire. Plugs fouled and replaced. Computer ref lashed. This falls under the extended warranty provided by the class action suit due to Variable Cylinder Mgmt. problems. 25300 mi Navigation screen would display "Disc not read" after restarting the vehicle. Navigation system was replaced. 26000 mi Passenger side around the glove box has a loud rattle. Glove box replaced, but rattle still there. 32000 mi Rattle in glove box. They remove glove box and installed foam between the two points that cause the rattle when vehicle is moving. US $375 annoying noise when driving and riding over bumps. Sway bar linkage. 80000 mi Lumbar support on drivers side stopped working. 58000 mi 2 bolts loose 2 bolts missing at transmission and drive shaft connection. 22000 mi Center console did not light up. Major issue at night! C $300 Could not have Wheel alignment done without repair to suspension part. Tires were unevely worn (drivers side). US $85 Interior wear attributed to Workmanship issues. Replaced center console lid and door leather due to unusual wear and tear. Dealer agreed it was workmanship issue from manufacture not owner. 25420 mi Power driver seat moving jerky. Replaced seat rails. Back seat latch broken and seat would not lower. Plastic clip holding cable was broken. Plastic handle mechanism replaced. 38420 mi Rust spotting on the tailgate fixed by TSB 11-016 at their cost. See our lemon odds and nada odds page to see vehicles with no repairs or vehicles with more than three repairs. 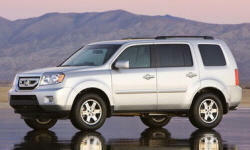 To see how frequently 2011 Honda Pilot problems occur, check out our car reliability stats.